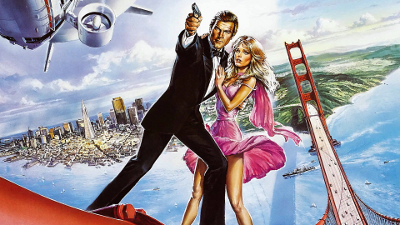 This is a John Barry composed soundtrack for the 1985 James Bond film A View To A Kill. It remains the only film in the franchise where Bond takes time out to cook the leading lady a quiche. This soundtrack is interesting because John Barry allows for some modernity so you get a vague sense of transition and modern (eighties) flourishes. It's a double edged sword of course and makes some of the music sound a little cheesy here and there but it's still a lavish and highly entertaining score in the best Barry tradition. Romantic and exciting with some trademark brass and subtle string arpeggios. The soundtrack begins with the title song - performed by eighties popsters Duran Duran and generally regarded to be one of the more memorable in the history of the venerable series. It was something of a departure at the time to hand over a Bond theme to a modern pop group (Eon usually went for a big traditional ballad, usually by a female vocalist) and could so easily have been a complete disaster but the end result is surprisingly good and makes for a rousing start to both the picture and the soundtrack album. The lyrics are as pointless as ever ("The choice for you is the view to a kill. Between the shades, assassination standing still. The first crystal tears, fall as snowflakes on your body...") but the song is very good and lyrics never matter too much with Bond themes. 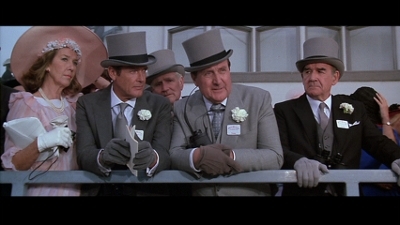 A View To A Kill is very strident and jarring, more aggressive than the usual soppy Bond ballad and very immediate. The electric guitar sound is terribly dated but I suppose that's part of the charm now. Duran Duran apparently nabbed the Bond theme when one of their members (not sure who, I don't know their names) approached Bond producer Cubby Broccoli and asked why they didn't let a more current act have a bash at a 007 song to shake things up somewhat. To the surprise of everyone (including I suspect John Barry) Broccoli permitted Duran Duran to have a go themselves and against the odds it all worked out fine in the end. Snow Job is next and the music used for the pre-title sequence (which deployed that old James Bond staple of the ski sequence with some preposterous snowboarding capers thrown in). This is classic John Barry and a great all purpose action composition. You could use this as the trailer music for almost any action film and it would work perfectly. It begins in ominous fashion in the trademark dramatic (even slightly melodramatic) John Barry style and then segues into blaring wah wah horns and that lush orchestral Barry soundscape. James Bond is an alternate universe where reality is heightened by about 9% (that's my theory anyway) and Barry's music is perfect to capture this quality. It's a stirring action beat used throughout the film and a reminder of how clever he was in arranging action cues so that the 007 theme would not have to be flogged to death during the film. The soundtrack for A View To A Kill is very of its time and sounds more modern than his vintage scores - ironically of course this eighties "modernity" does date it more than some of the sixties Bond soundtracks - and a good example of this is apparent on Snow Job. The electric guitar riffs and screeches that infuse the music border on the cheesy but they do (I think anyway) help to give the music a more driving sense of urgency to emphasise tension. They are good fun despite being a more than a trifle dated now. Barry would tone down these contemporary flourishes on The Living Daylights and produce a more traditionally classic (and superior) score but it's interesting of course to find him flirting with experimentation here and embracing electric guitars and some louder cues in the body of his score. May Day Jumpers is the music from the Eiffel Tower sequence. A great introductory gambit here from Barry that gives the music a sense of anticipation and awe. One can see how these films were lifted up a few notches and stood taller with Barry's music. This piece of music builds nicely for dramatic effect. Bond Meets Stacey is a soft orchestral piece of music that beautifully makes use of the main theme. Note the flute work here by Susan Milan here. Great stuff. I really miss the days when they used to incorporate the main theme into the body of the soundtrack. Pegasus' Stable is very Barryesque and a more somber piece to heighten tension and establish some atmosphere. Very moody orchestration and the little chimes that come in as the music progresses are very John Barry. Tibbett Gets Washed Out is very much stock John Barry mood music. The sort of thing used for the build up to the death of a character. There is that trademark John Barry ominous aura and frantic orchestration with a daubing of saxophone. Good film music although maybe not something you would listen to in isolation much. This anticipates very similar cues that would be a part of Barry's superb soundtrack for The Living Daylights. Airship To Silicon Valley is lush and orchestral with big rousing cues while He's Dangerous again deploys the Snow Job action beat but infuses big pounding drums and spins out into stratospheric wah wahs. Maybe a trifle too stereotypically John Barry at times but then that's not a bad thing. If you can make a great lasagna have it for dinner four days a week I say. Bond Underwater is enjoyable for being somewhat reminiscent of Barry's aquatic Thunderball soundtrack. This uses strings at the start and is very James Horner "Aliens" for a time before that trademark Barry rumble of orchestration and Bondian horns kick in. An interesting and effective piece of music that again anticipates the score for The Living Daylights. Wine With Stacey is very similar to Bond meets Stacey. It's an instrumental of the main theme played on a flute. Simple but wonderful. Bond Escapes Roller is more stock music and the sort of thing we've heard already while Destroy Silicon Valley is again sort of like John Barry stock music but much more complex than you'd expect. The music is designed to engender a sense of awe and wonder with a subtext of danger. It's not right in your face but builds tension with drums and classic horn interjections. When the music softens you can hear some of that flute again. It's very good. Golden Gate Fight uses the "Snow Job" action beat again but not in such a frantic driving sense. The composition here is loud but somehow more intimate and deliberately static/repeating. Understandable as this is scoring a fight not a chase. The soundtrack ends with an enjoyable alternative version of Duran Duran's A View To A Kill (which was used for the closing titles). This is an impressive soundtrack album on the whole that is not quite one of Barry's very best but still manages to throw the opposition off a roof before dispensing a tie straightening quip and glugging back a vodka martini. Dated in places but still very enjoyable.